The time has come! Why more MMORPGs don’t offer this same feature boggles my mind. Greetings adventurers! My name is Rob Thody and I am a QA lead and project coordinator of the Guild Wars 2 Live Response Team. On this development team we primarily spend time with fixing bugs and implementing quality of life features. With the help of both external and internal feedback, we selected the project for our first August launch; a tool that we hope will help make things a bit easier and convenient for players. Allow me to introduce to you… the wallet! Inventory management can be a tedious and time consuming part of playing almost any MMO. For many of you, tokens and badges and currencies were all separated across your different characters. 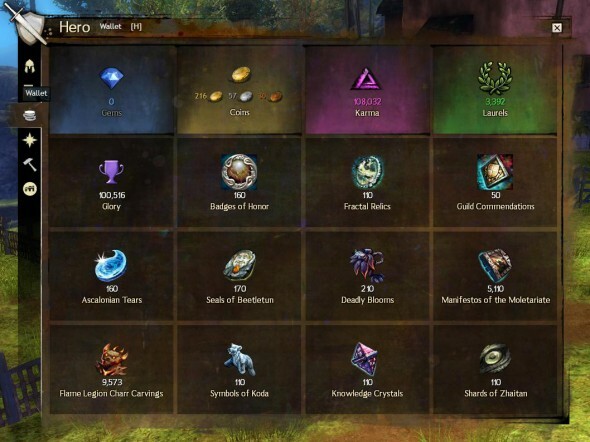 The Guild Wars 2 Live Response Team decided that it was time for a change when it came to the various tokens and badges clogging up your inventory bags. Wouldn’t it be nice if they all existed in one location, shared amongst all the characters on your account? The wallet! One place for all of your Badges of Honor, dungeon tokens, coins, karma, gems, and laurels, and more. More importantly, everything existing on the wallet will be bound to your account. That means that the sum of all gold, karma, tokens, etc. across all your characters will all be dumped into this wallet and shared across all your characters. What if you get an Ascalonian Tear on your ranger but want to spend it on your warrior? No problem – now that will be possible! 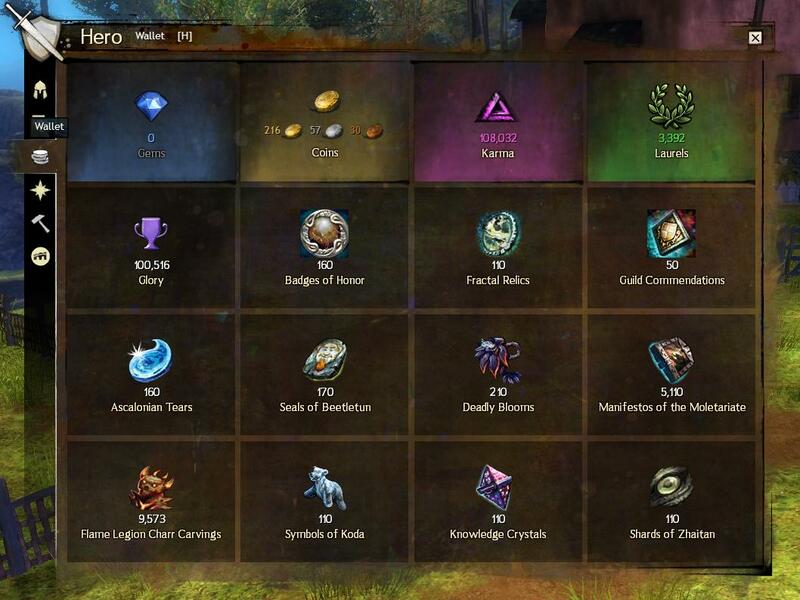 What if you have 10 gold on you mesmer, and 4 gold on your thief? Once you log in, your currencies wallet will show 14 gold – the sum of the gold on your account! So here’s the important thing: in order to share all these currencies among the characters on your account, you’ll need to log in to each of your characters individually in order for their currency to roll into the wallet. We hope the wallet makes life a little easier for you and all your characters. Happy hunting!